It's time to name a few of my favorite toys from the 80's: Strawberry Shortcake, Cabbage Patch Kids, Care Bears, Barbie and the Rockers and ... My Little Pony. Over my childhood years I collected several of the colorful, chunky ponies and even a few baby ponies. My mom kept them tucked safely away and now my daughter enjoys playing make believe with my original ponies and a few of her own newer models. First introduced in 1983, the My Little Pony line has stood the test of time. 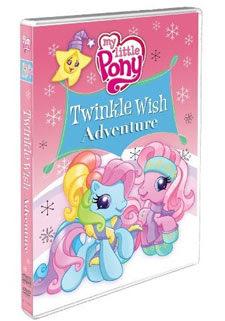 Yesterday, Oct. 13th, Twinkle Wish Adventure , a new winter-themed My Little Pony DVD released in stores and online. In this adventure, the Ponyville ponies are making preparations for the upcoming Winter Wishes Festival. The pony friends participate in an ornament making contest. The winner of the contest gets the honor of placing Twinkle Wish, a wishing star, on top of the ever forevergreen tree. But due to a jealous act, the wishing star ends up in the hands of a dragon named Whimsy that lives on Willy Nilly Mountain. The seven ponies -- Pinkie Pie, Rainbow Dash, Scootaloo, Toola-Roola, Cheerilee, Sweetie Belle and Starsong -- work together to recover the star in time for the festival and end up learning an important lesson about friendship. I don't recall watching any of the My Little Pony animated shows as a kid, but apparently several have been produced. Even though it is a new production, the movie has that same enduring/a little bit cheesy 1980's classic animated feel. This is definitely a girly movie. My preschool daughter intently watched the adventure unfold and especially liked all the cute, catchy songs. The DVD sparked her imagination and she now takes her own ponies on their own adventures. I imagine Santa will put at least one of the pony characters from the show in her Christmas stocking this year. She remarked after watching the movie that "all the ponies have lovely hair." My Little Pony: Twinkle Wish Adventure received the Dove "Family-Approved" seal for all ages and includes messages about friendship, making the right choices and sibling rivalry. I also just learned that from October 23rd through November 12th McDonalds will feature My Little Pony characters in Happy Meals. Shout! Factory has sent me an extra My Little Pony: Twinkle Wish Adventure DVD to give away to a Brimful Curiosities reader. • Contest ends on Monday, October 26th, 2009 at 11:59 PM CST. 1st extra entry: Visit Hasbro (Meet the Ponies) and leave a comment with the name of your favorite pony. Thanks for the chance to win this -- our kids would be thrilled. I know my girls love "Pinkie Pie." I would love to win this DVD for my niece. She loves My Little Ponies! Thanks for the giveaway. My niece would like them ALL! Especially Rainbow Dash. I think Sweetie Belle is adorable! I really love these! Thank you so much! I love My Little Pony! I had tons of them as a little girl! I'd love to win this for my niece. I don't remember watching My Little Pony at all as a child. My daughter LOVES My Little Pony and plays with her ponies every day. She would love this DVD! My favorite pony is Rainbow Dash, but my daughter likes Pinkie Pie. I'm so glad you directed me to the Meet the Ponies section of the Hasbro website because my daughter is always asking me their names. Now, I can just check the website! Thanks. My daughter is a big pony fan and would love this for Christmas. Our favorite pony is Scootaloo--my daughter has her remote controlled scooter. My daughter just got a pony toy for her birthday and is really enjoying it. I think she will love the movie. I remember watching Ponies what I was little, and now my niece loves them too. Sounds like they send a lot of great messages! We definitely have some My Little Pony fans in my family. Please enter me! My daughter loves My Little Pony movies, so she's be thrilled to see this new one, Twinkle Wish Adventure! After reading about all the ponies at their hasbro website, my daughter chose StarSong as her favorite pony. They both love singing and dancing so it's a match made in heaven! Pinkie Pie but we have Ponies all over the house right now so this video would be perfect for the girls! My daughter likes Rainbow Dash, but is actually crazy about anything My Little Pony!! I have three young children who would love to get their hands on this movie! Starsong was my favorite growing up! Now my little sister plays with the ponies but hasn't seen the movies yet!! The little ponies are so cute! My daughter LOVES Pinkie Pie and would love this movie. Thanks for the chance. Alison loves Starsong the best. This looks so cute! My daughter loves My Little Ponies. Great giveaway! Just for fun, I took the personality quiz on Hasbro and I'm Cheerilee. My daughter would be Rainbow Dash. Oh I would sooo enjoy this with my neice! She loves My little Pony! My daughter loves MLP so much I had to go on ebay and buy 6 of them that they don't make anymore for a Christmas present. What you do for a three year old! I used to have a million of these when I was a kid! I hope my daughter will love them too! My daughter is really starting to enjoy My Little Pony, I wish I still had mine from when I was a kid! She would of had a huge collection with mine and hers together! My favorite pony is Rainbow Dash!My daughter loves Pinkie Pie! I loved My Little Pony when I was a kid. This would make a great Christmas present for my cousin's daughter. Thanks for the chance at this giveaway. My daughter really likes starsong! You know... So many of the toys and cartoons from my childhood are starting to come back and I love it.. However, have you realized how much they "change" some of the toys/cartoons to make sure kids today will like them? Would love to share this with my daughter.. This will be great for my daughter. Please count me in. My niece would love this. My four year old loves My Little Ponies and this would be so perfect for her. Our favorite pony is Scooterloo. My daughter is just getting into My Little Ponies, so she would love this. I would love to give this video to my girls for Christmas. Everywhere my girls go, so do their my little ponies. The store, the car, bedtime, bathtime... you name it. They would absolutely love this DVD. my niece is the biggest fan!! My daughter LOVES My Little Pony, so I would be thrilled to win this. Thank you! My daughter loves her "ponies" and would love to have this. Dawn used to have the whole collection but they got lost in a move. Would love to win this for one of my nieces. My Little Ponies are so cute. My granddaughter would love this! They are so cute! My daughter would love this! Thanks for the chance! My daughter loves My Little Pony and would love to watch this DVD! Thanks! My daughter likes Pinkie Pie the most! My mom keeps a DVD library at her house for the grandchildren so we are always looking for family friendly movies to add to it. This would fit the bill perfectly! Thanks for the chance! Sweetie Belle is our fave! Thanks! We like Sweetie Belle! Please enter me! I'd love to share a childhood fave of mine with my daughters. Thanks for the giveaway! My niece would love this. She is obsessed with My Little Pony. I would be so happy to win this! Thank you!! My daughters love My Little Pony. Great Giveaway.